TS BC Study Circle Free Coaching Entrance Exam Hall tickets 2019 for TSPSC Groups Free Coaching Admissions. 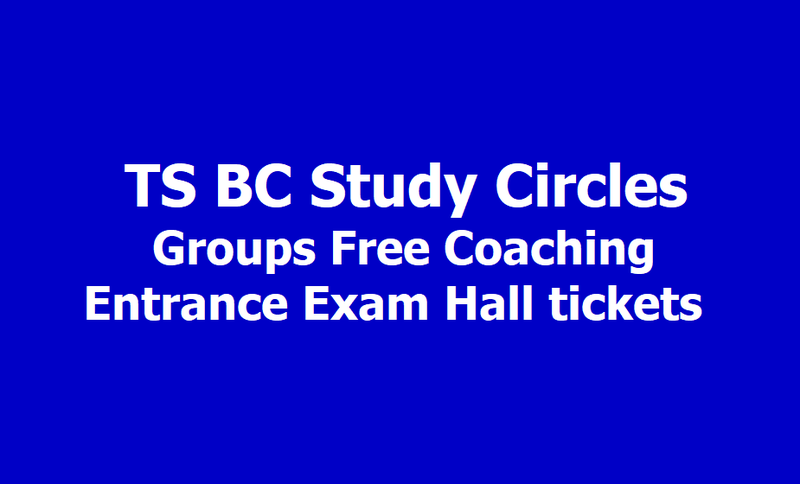 TS BC Study Circle Groups Free Coaching Entrance Exam Hall tickets 2019. TS BC Study Circles TSPSC Groups I, II, III Exams Free Coaching 2019 Screening Test Hall tickets download. TS BC Study Circle Free Foundation Coaching (Group-I, Group-II and Group-III) Entrance Test Hall tickets. Government Of Telangana Backward Classes Welfare Department issued the Notification for Admissions into TS BC Study Circles for free coaching to TSPSC Group I to Group IV Services 2019 Recruitment Exam. Applications were invited from eligible candidates belonging to Backward Classes (BCs), Scheduled Castes (SCs) and Scheduled Tribes (STs) for Common Screening Test for free coaching for Group -I, Group-II, Group III Services Examinations to be conducted on March 24 by the Telangana Service Public Commission. Step 6: Take a print and bring to the exam hall and after exam, save it for future purpose.